NOTE: This content is old - Published: Sunday, Nov 18th, 2018. 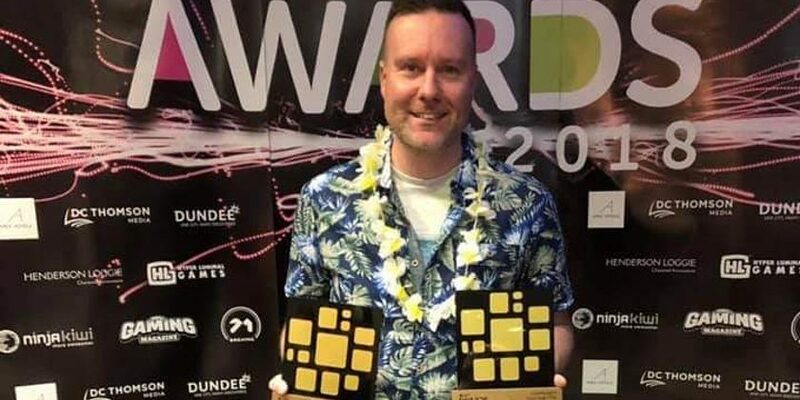 At the UK Games Fund Awards in Dundee last Wednesday, Senior Lecturer in Computing Richard Hebblewhite scooped Community Contributor of the year after being nominated for his outstanding contribution to local and regional games industry development. His games development team’s innovative Enterprise Lounge won the Tranzfuser Local Hub of the Year award. ‘The Lounge’, based in the university, offers support to both current students and graduates throughout the process of building their own game development studios – as well as expert guidance and mentoring. “It’s an absolutely great feeling to have the work we do here at Glyndŵr recognised by the industry – I’ve woken up this morning still smiling,” said Richard. You can find out more about Wrexham Glyndŵr University’s BSc (Hons) Computer Game Design and Enterprise degree here.